Looking for a luxury Africa travel experience? Well look no further. Situated in the Kapama Private Game Reserve nestled between Blyde River Valley and Kruger National Park is Kapama River Lodge. Here you will find one of four individually appointed and luxurious camps. This property truly is a luxurious haven for those looking remote paradise escape. In 1986, Johann Roode bought the land on which Kapama stands with the intention of grazing cattle on the grasslands. However, within a year he switched his focus to eco tourism, and so Kapama was born. 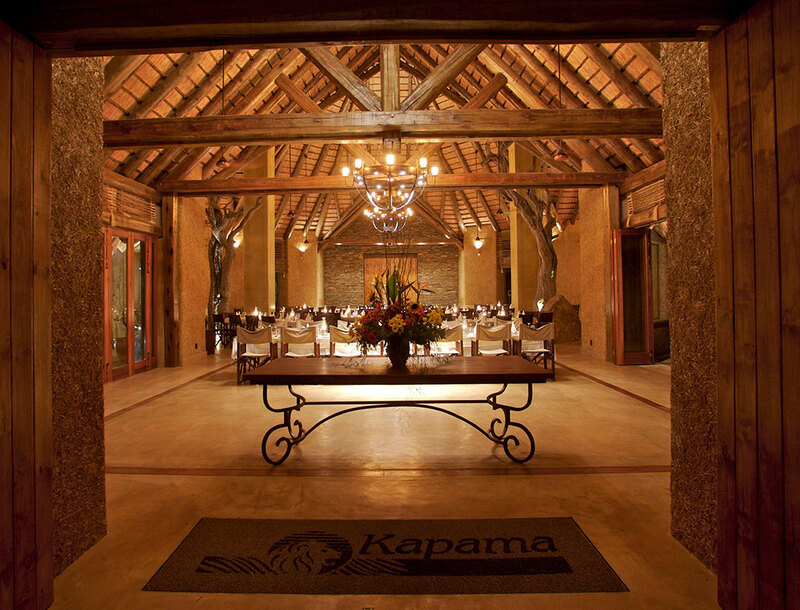 Over the years Johann began to develop Kapama into the ecotourism destination it is today; dedicated to the celebration and preservation of the wildlife and environment. The Roode Family still own and manage the property, making it the largest family-owned reserve in the area. According to local legend, there was once a lone lion named Kapama that lived on the land. It is believed that he was enormous in size and crafty beyond measure. Every young man in the village had pitted their hunting skills against the great beast. However, the infamous lion evaded them at every turn. Such an incredible lion, people started to believe that he was an ancient king who had been condemned to roam the land in animal’s body because of a transgression when he was King. The belief that he was a king reborn as a lion strengthened when due to a lack of food and water, the people and animals suffered greatly. But the great “king” Kapama knew exactly where to find water and was able to track the fattest game. The young men of the village, who had once tried to hunt the king, had grown to revere him and learned to follow him rather than hunt him. This change led them to be able to feed their tribes. Eventually, when the rains did arrive, it was so heavy it created a new river, which was named Kapama. According to legend, the “king” had paid his dues and he was never seen again. It is said that Shangaan chiefs that demonstrated extreme acts of bravery were honoured by being reborn as lions. Kapama was the name of the last chief of this revered bloodline. If you look deep enough into the eyes of the lions of Kapama, you can see past the beast and into the soul of a Shangaan chief. The largest lodge of the four; River Lodge is currently made up of 64 beautifully appointed rooms, River Lodge’s wide, open spaces and airy design provide a constant reminder that you’re sleeping under the African sky. The atmosphere of River Lodge is a lot more cheerful and social than their smaller, quieter camps. This atmosphere makes the lodge perfect for families and groups. Of the 64 rooms, there are 40 suites, 16 spa suites, 4 family suites and 2 royal suites. The suites offer a private patio for your private enjoyment of the lush surroundings. Furthermore, the suite itself is beautiful and spacious, with luxury amenities and sprawling views of the stunning landscape. The spa suites are feature stunning floor-to-ceiling glass doors and frameless windows offering expansive views of the reserve – even from your bathroom. Perfect for those looking truly relax and unwind, the spa suites come have a spot of yoga from the privacy of your patio while overlooking the splendour of the bush. The family suites offer a spacious open plan layout allowing for extra space to spread out, or to easily add more beds for kids. With multiple balconies, there’s more than enough space to enjoy the gorgeous remote bushland. Lastly, the Royal suites, offer the utmost luxury and opulence in every detail of the room. With everything from a private lounge to make a hot cup of tea or coffee to a recliner couch on your very own spacious patio, the royal suite won’t disappoint. You can even revel in your beautiful surroundings from the giant windows in the bathroom, as you get ready for your day. Furthermore, the dual showers in the en-suite bathroom overlook the surrounding bush and wildlife. Considered one of the best safari spas in Africa, the River Lodge Spa is a favourite amongst all guests. Relax by the spa pool or get a quick workout in before you hand yourself over to their highly trained and experienced beauty therapists for one or more of River Lodge’s African spa treatments.